The three-dimensional (3-D) Cartesian coordinate system (also called 3-D rectangular coordinates) is the natural extension of the 2-D Cartesian graph. The key difference is the addition of a third axis, the z-axis, extending perpendicularly through the origin. The first octant of the 3-D Cartesian coordinate system. The x-axis corresponds to where the left-hand wall meets the floor. The y-axis corresponds to where the right-hand wall meets the floor. The z-axis corresponds to where the two walls meet. Just as the 2-D Cartesian graph is divided into four quadrants, the 3-D graph is divided into eight octants. 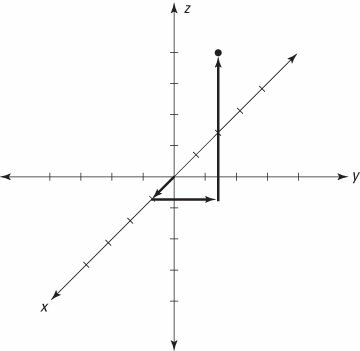 From your perspective as you look at the graph, you’re standing inside the first octant, where all values of x, y, and z are positive. Plotting the point (1, 2, 5) on the 3-D Cartesian coordinate system. 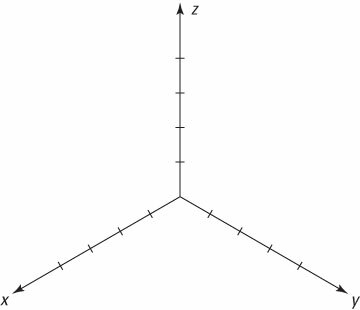 The figure above shows the complete 3-D Cartesian system with the point (1, 2, 5) plotted. In similarity with regular Cartesian coordinates, you plot this point by counting 1 unit in the positive x direction, and then 2 units in the positive y direction, and finally 5 units in the positive z direction.